We've all heard the saying that the eyes are the window to the soul... whether you agree with the sentiment or not, you probably spend quite a bit of your beauty routine focusing on your eyes. To keep your peepers in tip-top shape, follow our 3 easy steps. Everyday we put our eyes through a lot of strain and exercise. Couple that with issues like allergies, surgery or swelling, and your eyes really need some relief! Our go-to for pampering the eye area is TheraPearl Eye-ssential Mask. It can be frozen or heated to provide incredible relief. Say goodbye to puffiness, dryness, swelling or inflammation. They also make a great stocking stuffer! A fave among men AND women is SIRCUIT Cosmeceuticals I.Cee.U. After being featured in GQ Magazine, this eye gel quickly became a favorite for its intense plumping and firming benefits. Some clients even noticed results in just a few days! When we need a super quick fix, we turn to G.M. Collin Instant Radiance Anti-Aging Eye Patch. In just 20 minutes, this handy little pack reduces pesky fine lines, crow's feet and dark circles. It's perfect when you need to really wow the crowd at a holiday event or family pictures! If you're also battling lines around your mouth, G.M. 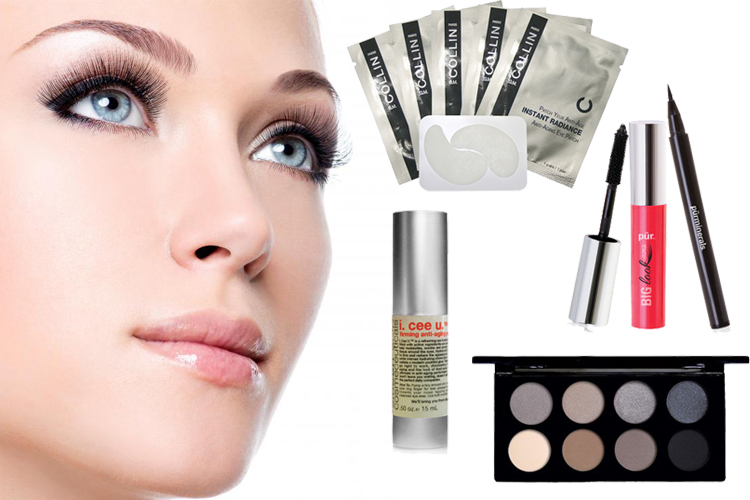 Collin Eye Contour Corrector is a great two-in-one for the difficult eye and lip area. Most people prefer to emphasize either their lips or their eyes with makeup. We love emphasizing the eyes because there are so many different techniques you can use! Of course we love to emphasize the eyes with eyeshadow! There are SO many incredible colors and formulas these days, it's hard to choose a favorite. To cut down on products, we like using palettes or sets, like gloMinerals Alloy Eye Collection. This eight-color palette has beautiful shimmer and matte shades that are perfect for winter! Create endless looks for day or night with this fabulous set! For a smaller palette, check out Osmosis Colour Eye Shadow Trio. Each set contains three colors to easily create a complete look. Now that we've given you our tips, would you like a chance to win ALL of these incredible products and MORE, valued at over $1500?!?! Enter our Winning Wonderland - All Eyes on You Holiday Giveaway between now and November 30! Visit beautystoredepot.com for full giveaway details and to see all the amazing prizes! Good luck!! I'll have too try this for my sons wedding. We love the G.M. Collin Instant Radiance Anti-Aging Eye Patch for a quick radiance booster! Let us know if you have any questions! Thanks for following!